I don't know which makes me smile more; the beautiful lilac blooms of False Dragonhead or the sweet skippers and butterflies that have been visiting the flowers all week. The silver spotted skipper was spotted recently. The silver hairstreak is upside down. You'll need to enlarge the photo to see its impressive 'eyes'. Mother Nature did a fantastic job when she designed the flower~Tall wands of tubular flowers that bloom bottom up in early fall. 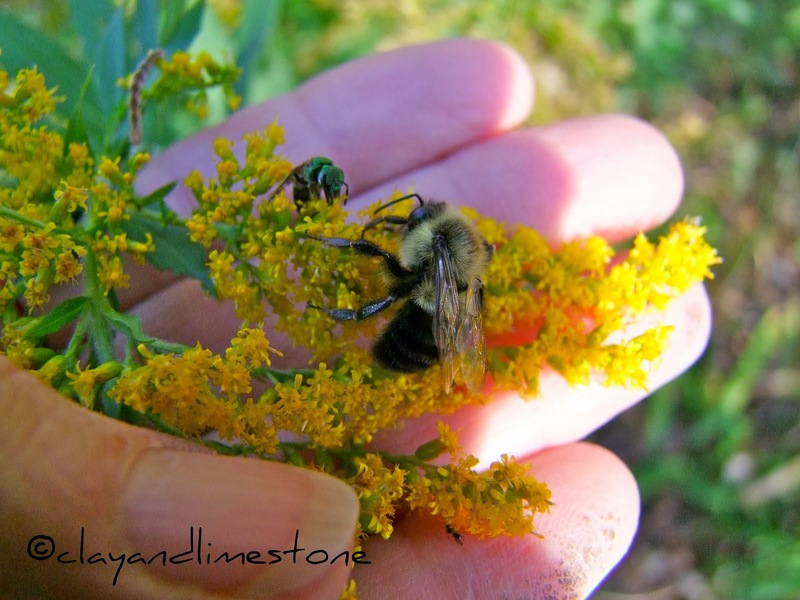 They're a magnet for pollinators~big and small! The plump little bodies of the smaller bees just scoot down into the tubular flowers. No problem if they're too big to fit inside the flower. Carpenter bees will chew a hole into the flower to reach the nectar. Clever creatures! In many of your gardens it might be a tad aggressive colonizing. It can go wild in rich, moist, acidic soils. Clay and Limestone only does moist and rich occasionally! Instead, we have a slow dance of movement through the garden, with me cutting in to transplant them where I want them to grow. They are lovely flowers, but, I think they need to be massed for the best ever color show and statement. Plant them next to late blooming phlox, boltonia and asters. In my garden they are planted with Aster tataricus. Welcome to Clay and Limestone and Wildflower Wednesday~We're here to celebrate your favorite wildflowers on the fourth Wednesday of each month! Just sign in to Mr Linky, then leave a comment about your post and we can stop by to celebrate with you. Now there's a nice one I have plenty of room for! I remembered to participate this month! What I find interesting is that the wildflowers always seem to be able to thrive despite the drought conditions we have. Of course that's why they are such a great choice to plant for a xeric garden. What beautiful photos of false dragonhead. The Bridge of Flowers in Shelburne Falls has some big healthy clumps that are a special joy at this time of the year. I really like obedient plants, and mine have not become aggressive. They've spread slightly, but not out of control in any way. I had a variegated form of obedient plant which died out on me. Definitely had the moisture, but perhaps not the well-drained. The bees are humming in my asters, but I chose to profile a less well-known native. i've loved your wildflower posts and wanted to participate myself. i finally remembered to put wildflower wednesday on my calendar! i hope you enjoy my roadside weeds in shallotte, nc. This is fun Gail. Isn't it interesting that your wildflower is our plant to buy in a pot. I think they're prettiest when they're grown in a large patch - such a pretty colour - it should be grown more often. The bumbler photos are terrific - can practically see the wands of flowers shifting to the right as he lands. Tucked in with my yellow flowers is our Hypoxis rooperi. Have to say that they look identical, but the names are different. Three ranks of leaves? Again it is always the leaves that fascinate me. Well, that's one advantage to having dry, difficult soil. The color of the Physotegia shines next to whatever yellow thing you have behind them. Do you ever play with the flowers, to make them stay in a different position? Hi Gail your obedient plant is thriving while mine this year has been sulking. I've got some flowers but nothing like yours and I have yet to see a single butterfly on any of the blooms. Your wildlife shots are awesome. I've linked in again this month taking you all for a walk with me along a scottish lade and seeing all thats wild and wonderful along the tiny little dirt tracks that line its banks. The bees and butterflies sure like this plant in the fall, don't they? That little yellow bee in the middle of your post is so cute. I'm absolutely besotted with that bee you caught in mid-flight. What a wonderful shot. Thanks for hosting this meme as every month I learn a little bit more about native plants around the world. I've never been able to get the Obedient plant to be obedient! Must be using the wrong approach. Your photos make me want to try the pink variety (I only have the white). It looks gorgeous in a large clump like you have. If I dig up the grass in the back yard, I could add some, right?! Hope it's cooling off for you so you can get out in the garden. I know you have tons to plant! Great pictures! I love the bee in mid flight and all the beautiful shots of butterflies. Love your "pollinator shots". My one attempt with false dragonhead led to a not-so-obedient clump that quickly became a target for my stress-relief efforts (there's something very satisfying about tearing out huge clumps of aggressive garden invaders!). Glad to hear that yours is more well-behaved. I like obedient plant, but don't have room for it to spread like it does. I looked at the calendar today, and saw there was one more Wednesday, so didn't do a WW post, because I had decided it was next week. I should have come over and checked first. I am so scatterbrained! I may go ahead and do one tomorrow, depending on what the weather is like after work. I didn't look at the calendar and realize it was Wildflower Wednesday till yesterday morning! I was gone much of the day yesterday, so I'll try to get a post up later today. This is one native I have not planted in my yard. Thanks for the wonderful showcasing of this wildflower. Rose, Expand is my motto! Go for it and let them duke it out! Heather, hello~give it a try~If your soil is rich and loamy, plant it in a container. gail...happy autumn first of all, now for the temps to cooperate, whew! i love all your wildflowers and the flying creatures is attracts. your garden looks lovely as ever. Always get a kick out of seeing the silver hairstreak...first year for us. Obedient Plants are now a keeper in this garden. Beautiful photos, I love this time of year with all the butterflies traveling through, although I think the stranglers are the only ones left here in Iowa. Great shots of the blooms with all the bees. Nice meme! I'll try to remember next month (if there are any wild flowers blooming). I'm so impressed with your pictures of flying bees. I love it when the bees totally disappear into accommodating flowers, too! Just beautiful, Gail! As before, I'm so impressed with your pollinator photos. And maybe I'll remember W.Wednesday next month--can't believe I forgot again. Thanks for hosting, anyway! Great way to discover some fun blogs. Very beautiful. Heart raising contrasts in colour. In my garden, they kind of misbehave, but I still have them here and there. They are so very pretty and the pollinators love them, so I pull a lot and let a few "be." I'm late, I'm late, for a very important date! I was thinking next Wednesday as Sue was Gail. Post editor is acting up, but I'll work on a Wildflower Wednesday post for the weekend. I haven't grown obedient plant before. It might be somewhat obedient in our dry part-sun spots. 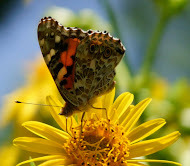 Love the color, and love your wonderful pollinator shots!